For those without comedic tastes, the so-called experts at Wikipedia have an article about Ganges. The source of the Ganges in Buddhaland. 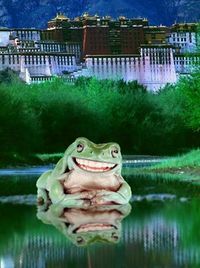 The frog is smiling because he just made doody in the source of drinking water for 1200,000,000 people. The Ganges River flows through India. The Uncyclopedia Board of Ultimate Know-It-Alls had the basic facts, but we wanted some details. So we provided our ace reporter Dirk Snyddering with a baloney sandwich and a ticket to India, flying Catapult Airlines. His mission: travel the length of the Ganges and send us a complete report. What follows is a transcript of his audio diary. "Before leaving New York I consult my library of 19th-century authorities on India. I learn that the Upper Ganges is usually defined as the upper part of the river. By contrast, the Lower Ganges is nearest the ocean -- and the middle part is between the upper and lower." "But I have a plane -- or, rather, a catapult -- to catch. Off we go!" "I land on Catapult Airlines' dedicated haystack on the outskirts of the ancient town of Haridwar, and only bounce a few times. Good thing I am wearing my bicycle helmet." "My hotel is a typical Indian establishment: a wooden ceiling fan turns at a speed that only charity would describe as 'lazy', rattan stools are pulled up to the dented zinc bar counter, and an immense Sikh security guard in a red turban lurks behind the potted palms. I meet my guide, Mohat Pujadarbhat, in the bar. He is a battered fellow, scarred by the hard life these third-world peasants lead. I ask him how he earns his meagre daily bread -- or chapati, as they say in these parts." Mohat: "I am being a programmer specialising in embedded systems. Industrial automation, you understand, yes?" "If I understand him correctly, he tells me that he harvests dung from the sacred cows and sells it in the city. Many times he finds no buyers, and must eat his own wares just to stay alive. We leave the hotel -- the Googly-Poogly Inn or whatever it is -- and walk through the dusty streets of Haridwar to the banks of the great river." "The Ganges flows from the high glaciers of Buddhaland through remote gorges and issues forth onto the plains here, at Haridwar. From this point the mighty river flows 2,000 kilometers through the appalling poverty and festering squalor of India to find its final resting place in the Hindu Ocean." Mohat: "Begging pardon, is the Bay of Bengal where Mother Ganga is flowing into. Is no such ocean as Hindu Ocean." "And as my ignorant but lackwitted guide reminds me, Bengal tigers still roam the hills and thickets of this Godforsaken hinterland. Wild and savage animals abound here. We shall have to take great care to avoid being eaten. 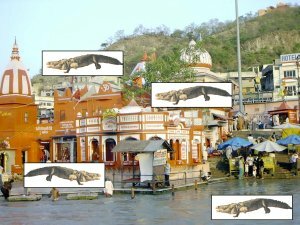 Even here in the city the heathen folk who come to bathe in the Ganges for good luck must watch out for deadly mugger crocodiles. Indeed these beasts are everywhere, stalking through the crowds in the morning sunlight." Fierce mugger crocs along the banks of the Ganges at Haridwar. Our correspondent Dirk Snyddering swears that this image is accurate and has not been altered in any way. "The superstitious Indian peasants walk unconcernedly past the savage reptiles, trusting their heathen gods to protect them. I take several pictures to document the unbelievable sight. The heathens believe that Sobek -- as they call the crocodile god hereabouts -- will attack only unworthy or blasphemous people. I can only pray the Lord Jesus will show mercy to the souls of these unfortunate villagers...even if those very souls bear the horrible scars of the satanic Sobek's teeth." Mohat: "Excusing me, but Sobek is being Egyptian crocodile god, not Hindu. And the crocodile is never coming so far north as Haridwar you know. Is being only in the lower river." "Yes, yes, Mohat. Now shut up -- I have read Sir Piddlie-Softbrayne's Natural History of the Indian Subcontinence and so I know what to expect. Let's go back to the hotel -- I need to recharge my laptop. They do have electricity here, don't they?" Mohat: "Yes, of course. There are many hydroelectric dams in the mountains. And also is being the Narora nuclear power plant." "I thought that India used bullocks to generate power...? Oh never mind. And so we leave the banks of the mighty Ganges and push through the crowded, almost medieval streets back to the Muggly-Fuggly Inn, or whatever it is. Truly this is a backwards town in a primitive land." "Tomorrow we start on our downriver trek. Hopefully Mohat can locate transport more sophisticated than an oxcart." "Yesterday Mohat managed to charter a tour bus, and we motored south along dusty secondary roads for ten hours before reaching Anupshahar." "Here in this provincial town we are in one of India's ancient seats of history and magical lore. Unfortunately I am not well; the unsanitary native food has given me a raging case of dysentery." 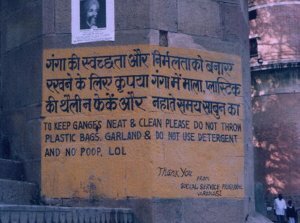 Anti-pollution sign along the Ganges. Mohat: "Yes, I am warning you about eating Domino's Pizza every night. You should have been having some nice vegetables and rice." "Right...well, as usual Mohat is no help. I crouch forlornly in the hotel bathroom and meditate on the amount of human waste which enters the Ganges. Hundreds of millions of gallons of raw sewage pour into the river every day. I think that during the past few days about half that volume has been pouring out of me." 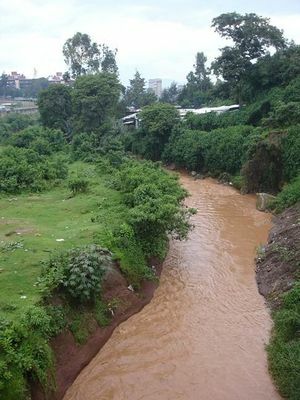 "But despite the pollution, the natives attribute all sorts of curative properties to the river water. They -- HNNNGNRRRGGGNHHHH oh GOD I'm dying -- they think it cures gangivitis, and gangrene, and ganglion dysfunction, and -- URRRNGGNGUNGGGGGH sweet Jesus it's pouring out like brown syrup -- other diseases that begin with "gang". Mother Ganga, as they call the river hereabouts, inspires -- uuughgh Ow! RRRRrrrrrNNNNNGGGGGGGHHHHHHH! gggnngh. UUUURRRRRGHGHH!!" "I'm terribly sorry, I have to sign off now and perform some, uh, in-depth investigative --ungh! hrugh! NNNNGGGGHHH! -- in-depth investigative reporting." "I leave you with a poem by Jamphur Singh entitled, appropriately enough, Mother Ganga." Thou art the Stairway to Heaven. If that's what she's after. "We leave the primitive but backward lands of the upper river and proceed southeast into the miasmatic plains. In its middle reaches the magnificent Ganges waters the fertile kumquats and latrines and lingams and whatnot of the peasantry. The humid air sticks to your skin like warm pancake syrup. Thank the Lord our tour bus has air conditioning." "Two days and 20 pounds of Lomotil later we reach the holy city of Varanasi. The drugs have done little to ease my colonic difficulties, I fear. 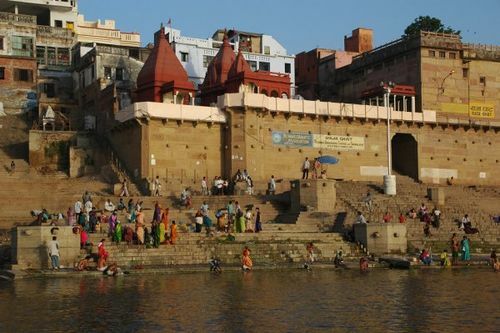 The city's real British name is Benares, of course, and is only called Varanasi by the superstitious Indians. Of this labyrinth of ancient stonework Mark Twain said,"
Hindus in colorful native garb bathing at Varanasi, as they call the city of Benares. "Certainly the bed in my hotel room looks that old. This is indeed a primitve land, hardly fit for a Baptist. I send down to the desk for more pillows and another Domino's pizza, with a special anti-diarrheal topping. Meanwhile Mohat has gone off to the local gat to puja himself or something. It is typical of these uneducated but ignorant peasants that they do not know that gat is slang for a handgun. As Sir Piddlie-Softbrayne wrote,"
He does the best he can do." "Having observed quite enough of the local ambiance through my hotel window, I settle down to half a pizza pie and an afternoon snooze, with the air conditioner set to 'arctic'. But hardly have I drowsed off when Mohat knocks on my door. He has brought some sort of Hindu remedy for my intestinal problems: according to him Western medicines like Lomotil are useless because my difficulties are caused by invisible demons. He tells me that the benighted Indians call these particular spirits Shigella Dysenteriae -- they must be diminutive offspring of Shiva the Destroyer, I suppose." "At any rate, I have nothing to lose -- certainly nothing in my digestive tract. I swallow the pellet-sized talismans he offers and retire to bed again, hoping for the best." "According to Wikipedia, Patna's population comprises 1,800,000 humans, 1,305,000 sacred cows, 230,000 pariah dogs, 30,000 temple monkeys, and several billion rats. Despite their voting majority the vermin have not done well in recent elections." "How different India is from the USA." "My dysentery is much improved, thank you. I am now on a strictly Americanized diet of Spaghetti-O's, soda crackers, and canned luncheon-meat-substance with extra gristle. Seasoned travelers like myself know better than to trust the local cuisine -- one curry gone wrong and you end up stuffed into a smelly foreign grave. Or, more likely, toasted like a marshmallow and heaved into the Ganges." "The Indian temperament is a curious one. A Hindu thinks nothing of stepping on the faces of those of inferior caste, and he thinks even less of kissing up to his superiors. He is by turns unbearably haughty, carelessly cruel, and obsequiously fawning. My considerable experience has convinced me that the Indian has a medieval mind and a pusillanimous personality --"
Mohat: "Excusing me, but what are you meaning when you say you have 'considerable experience'? You have not been leaving your hotel room for more than one-half an hour each day." "Don't be silly, Mohat. A gifted reporter like myself can perceive these social realities at first glance." Mohat: "Excusing me again, but have you interviewed one Indian writer? Or one city administrator? You are knowing nothing about modern-day India!" "See here, Mohat, I already know what India is like. I don't have to go wandering around interviewing people to find out. That would be worse than useless! As Sir Piddlie-Softbrayne wrote, everything there is to know about India is perfectly explained by the words curry, darkies, cow dung, and suttee. I have read all of Sir P-S's works, so I have no need to waste my valuable time talking to the local mahouts and pampooties." Mohat: "Pampooties? What is that? Who is this Sir Softbrayne at any rate? I ask you this: what is making this fellow an authority on India?" "Well, Sir Malcolm Piddlie-Softbrayne was Assistant Under-Librarian to Queen Victoria, and he is merely the greatest British authority on the Indian subcontinent which the world has ever known. And I assure you, Mohat, no one knows India like the British." Mohat: "Not even the Indians who live in India, I am supposing?" "Sir P-S learned everything there is to know about India -- and I mean everything -- without ever leaving London. And although he died in 1907 I assure you that his books remain the most comprehensive reference works on the nature of India and Indians. Having read all his books I know precisely what to expect as I travel along the Ganges." Will encase him like a glove. "Although now that I think about it perhaps the imagery of a river encasing a burnt-up heathen corpse like a glove is a bit of a stretch. But never mind! In the morning we are off downriver once again." "Strangely enough, the much-talked-about Farakka Barrage is not an artillery barrage at all, but rather a diversion dam. Once again the Indian's inability to use his own language misleads the casual reader. The dam is one of the finest products of Victorian engineering, very tangible evidence of the beneficial effect the British Raj had on this dark land. If I understand it correctly the dam diverts water from the Hooghly River into the Ganges in order to keep the Delhi-to-Mombassa channels from silting up." "In recent years it's caused quite an outcry, however. Bhutan has threatened India with an ecological disaster because the diversion would render its parish of Bangladesh unable to grow chutney trees. Or something along those lines. These tribal squabbles are quite impenetrable to the American mind—when we diverted all the Colorado River water to Las Vegas for the casino fountains we settled up with the Mexers by telling them that if they didn't like it we would pop a nuke right on their presidential palace." "It's quite simple to settle these differences, really." "At any rate, Farakka marks the beginning of the Lower Ganges and, in a rather remarkable coincidence, the end of the Middle Ganges. It's amazing how nature has worked that out so neatly." One of the cleaner areas of the river. "In the lower river the effect of tides from the Hindu Ocean become apparent. Unlike proper Christian tides, the sloshing of this sea follows neither a lunar nor a solar rhythm. Science has been unable to discover what makes these heathen tides rise and fall." "As soon as I have installed my personal effects at the Hyatt-Regency hotel I have Mohat lead me through the thronging streets to the waterfront. Everywhere one sees cripples, blind men, lunatics, beggars, crippled blind lunatic beggars, Java programmers, and other doomed souls. Eventually we hail a primitive Volvo taxicab and hurtle along Garden Reach Road smashing peasants out of the way and sending rickshaws flying." "At the Kidderpore docks skinny coolies are unloading cargo from tramp steamers: crates of gerbil feet, dried human goiters, broken pencils, burned hair, used chewing-gum...things that in a real country would be thrown in a landfill faster than you can say Eric Robertson. But it is rubbish like this which keeps the creaky wheels of third-world economies turning, however fitfully. I point to one crate and ask Mohat if he can read the chicken-scratch writing on its side." Mohat: "That is being some DPROM memory made in Taipei." "If I understand my uneducated guide correctly, the crate contains fermented penguin mucus from Chile. This will be used by the holy men -- or Brahmins -- to make the forehead-dot which to the Hindu symbolizes the mystical Third Eye, and which improves television reception." Mohat: "Do you know that at Netaji Subhas dock here in Calcutta we are having a 200-tonne hammerhead-style crane? Is being the largest shore crane in India." "Out of the blue my prurient but sly companion offers to guide me to a brothel where I can receive head and get hammered. I stare at the oily green water sloshing sluggishly in the ship basin. His offer is nasty, immoral, unchristian, and thoroughly disgusting." "I am tempted to take him up on it." "But the part about 200-ton women puts me off. Besides, I could never look my dear innocent wife Hilda-Marie in the eye again if I indulged in such foreign perversions. And she has only two years to go until she gets out of the penitentiary...assuming she starts no more cellblock riots, of course." "I am determined cover the last miles from Calcutta to the Hindu Ocean sailing on the waters of the mighty Ganges herself. Mohat suggests a Ganges ferryboat but I have doubts about its seaworthiness." The traditional Indian baghlah boat Jurgen Maersk, made of pine and buttonwood by primitive lepers. The ship is being warped along the quay at Calcutta before putting to sea. Mohat: "This style boat is being used daily for transport up and down river. It has very reliable engine, very experienced crew." "He says the strange little boat is protected by Hindu spirits, but despite his exhortations I choose a slightly larger -- and sturdier -- vessel. We go on board and Mohat arranges our passage. The captain is tall and fair, no doubt a member of the upland Hindu, the Basinjii people as they are called. He speaks some English, and I ask him how he became a sailor." Captain: "Vell, my fazzer and my grandfazzer both operate the herring trawler from Flekkefjord, which is a fishing village located southwest of Oslo. And so I am from a young age much interested in the sea. It is my good luck that I rise to command of the motor vessel for the Maersk shipping lines." "I ask him whether his ship is built to a traditional Indian design." Captain: "Ha ha, vell, is conventional design for the container-ship, ja. Now here you see the ship's house is nearer to the stern than amidships, the bow it is very bluff, and the hatches are nearly flush with the deckplates. It is the modern design for box-cargo vessel of 150 meters and larger. 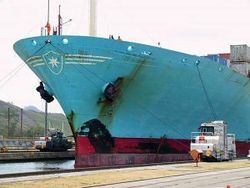 Now my ship in particular, the Jurgen Maersk, she is 225 meters in length and carry 3500 TEU. I haff five Norwegian officers, and the crew it is mostly Malay. Except for the Dutch cook, ha ha!" "It is fitting that we finish our journey on board a traditional Indian boat such as this. Ships identical to the one beneath our feet have plied the Ganges for a thousand years or more, luffing through the monsoon breezes, tacking down the crosscurrents, and breaking wind upon the shoals. Called by the locals a baghlah, these boats are hand-built from mugho pine and buttonwood by filthy lepers using stone-age technology. Entirely innocent of such modern conveniences as a measuring tape and carpenter's square, these primitive creatures use magical incantations to divine the dimensions of the hulls they construct. They cannot count beyond four --"
Mohat: "Excusing me, but I must interrupt. This is really being too much! While one is a very forgiving nature, one must object in strongest terms to the idiocies one is hearing you say." "My ignorant guide appears agitated by my description of the traditional Indian boatbuilders. Perhaps his heathen superstitions are offended by my intellectual superiority." Mohat: "Right from the very first you have been denigrating India and its people. You speak as though we are all savages and idiots who are stuck in the dark ages. And you are doing no journalism at all! Not one time are you speaking to anyone and then actually listening to what they say. Not once!" "Indeed, it appears Mohat cannot grasp the concept of modern research. Like all Indians, his irrational mind avoids thinking logically -- indeed, it avoids thinking altogether. Mired in mental sloth and dulled by centuries of cow-worship, the inhabitants of this benighted land have no ability to reason whatsoever --"
Mohat: "With respect, sir, you are being an immense disgrace. I am communicating with Wikipedia as soon as possible, and telling them that you are not a reporter of good intentions. And that you are not to be trusted. And that your writing should never appear on their website. And that your reporting should be deleted from the universe!" "I cannot help but burst out laughing. My silly guide tells me he will denounce me to Wikipedia. Wikipedia! Oh, my editors at Uncyc will get a laugh out of that! Off you go, little Mohat, carrying your heathen burden of sin and woe. I hardly think you will find satisfaction at Wikipedia, little fellow." "Our captain has the crew lower a dinghy and row Mohat ashore on the island of Gangasagar. The swells of the Hindu Sea roll sluggishly onto the muddy beach and the branches of the mangroves hang motionless in the tropical heat. I suspect that before sunset my erstwhile guide will be inside the stomach of a tiger or crocodile, beasts for which this uninhabited island is deservedly famous. Alas." "But now it is time to say goodbye to Mother Ganga, and sally forth upon the turquoise waves of the open sea. The captain has agreed to give me passage to America aboard his stout vessel—a good thing, as I do not care to trust my luck again with Catapult Airline's fast but violent method of intercontinental travel. I settle down in a deck chair with a flask of ready-mixed martinis and a somewhat dog-eared copy of The Mask of Lono. As I leave India I cannot help but recall the dying words of Sir Piddlie-Softbrayne: For God's sake don't eat the curry!" "Words to live by indeed." Dirk Snyddering emailed his report to Uncyc as a rather bloated MP3 file, and our staff edited it into the form you have just read. We had to cut out a lot of material in which Dirk commented on his childhood, his love life, his hair, his hangnails, and some other unbearably trivial garbage. Hopefully he will not email us a further report when the Jurgen Maersk makes landfall in Hawaii. This page was last edited on 2 November 2014, at 23:37.